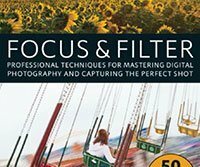 Longtime photographer and educator Andrew Darlow recently released "Focus and Filter: Professional Techniques for Mastering Digital Photography and Capturing the Perfect Shot." This new book offers 50 assignments for photographers to tackle and covers a wide array of subjects and photographic techniques. What helps this new book stand out is that it is aimed at intermediate to advanced photographers rather than pure beginners. Beginners will benefit greatly from the book, but it's nice for a book to target more experienced users. The topics covered include various camera settings, gear-centric topics like how to choose the right lenses and more advanced topics such as using external flashes wirelessly. For photographers who want to save money but still have access to useful gear, Darlow offers many DIY tips for making things like your own backdrop stand and sandbags. With such a wide variety in topics, there is no need to move through the book from front to back. I would recommend finding topics that interest you and reading the book in whichever order you choose. There are four overarching sections, however, including: mastering your DSLR, shopping smart, studio mastery and shooting in the field. In each of the subsections, which are organized as fifty "tips," there are "pro assignments" which lay out a relevant task for you to accomplish to help hammer home Darlow's tips and advice. It's a cool way to make the book an interactive experience. While most will be familiar with some of what Darlow has written, the bite-size nature of the layout and the large breadth of knowledge he offers and topics covered means that there is something for everyone here, from beginners to perhaps even working pros. The digital version and paperback versions are available on Amazon for around $13 and $14 respectively. The book can also be purchased from local and independent bookstores. "Focus and Filter" would be a worthwhile investment for anyone looking to improve their photography. You can learn more about the book here. "Focus and Filter" is published by Ulysses Press and is available wherever books are sold.